The leaves are falling, the days are getting cooler and now that schools are settled in there are a couple of dates coming up to note – especially if you’re here in Ireland where we’ve got a bank holiday weekend to look forward to shortly too! 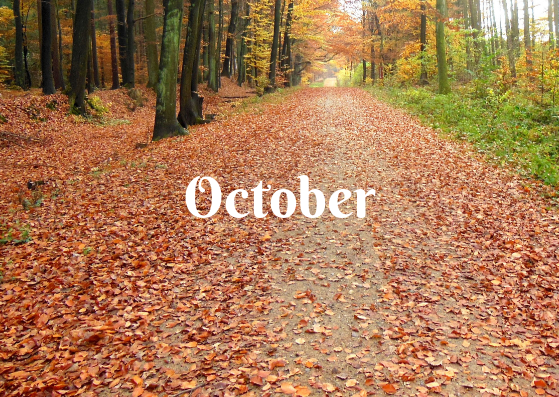 We started our monthly content posts in September and we’re continuing with our second update now with a list of dates you might like to note if you’re struggling for content for your social media this October. World Vegetarian Day – 1st October, an increasing number of people are changing to a vegetarian diet for both ethical and dietary reasons and even if it’s not your choice of lifestyle it’s becoming an increasingly popular option to maybe have a meat-free day in the week too. If you’re in the food sector this is a day you should be aware of. Boyfriend Day – 3rd October, a whole dedicated to that special man in your life! World Octopus Day – 8th October, I’m squeamish when it comes to an octopus and can’t even stand to look at them in the aquarim but they’re quite an intelligent sea creature who are thought to pre-date even dinosaurs! And like animals such as dolphins or monkeys they have been noted to be clever enough to utilise items from their surrounds like tools. Face Your Fears Day – 9th October, easier said than done maybe but there really is nothing like overcoming something that bothers you although it might be stressful at the time. World Porridge Day – 10th October, the healthy start to your day it’s one of those foods that we tend to either love or hate but there’s no denying it boosts your energy and really does set you up for the day ahead especially on these colder days. Global Handwashing Day – 15th October, something we shouldn’t have to remind people of but if it contributes to preventing the spread of diseases it’s definitely of a worthy of a day to remind us. World Food Day – 16th October, this day has been in existence since 1945 when it was created to celebrate the launch of the United Nation’s Food & Agricultural Organisation. Spreadsheet Day – 17th October, love them or hate them they’re a necessary part of business life and this day commemorates the day they were launched originally all the way back in 1979! Office Chocolate Day – 20th October, love them or hate them there’s usually nothing like a box of chocs to go down well in the office so why not pick up one of those Christmas boxes (yes the ones you buy early on special and eat long before December!) and treat your colleagues? Apple Day – 21st October, a seasonal fruit and something you’ll find in most Irish homes especially as we approach Halloween when the orchards are bursting with fruit why not celebrate that food which boasts just one a day keeps the doctor away! Punk For A Day Day – 25th October, you may well need to be of a certain vintage to appreciate this one and most of us won’t be in a position to sport a mohican or even a dress up in the clothes that were the signature of a generation but you could celebrate with a little of the music as even all these years later it’s still great to listen to. Pumpkin Day – 26th October, from pumpkin patches to carving competitions and of course some tasty foods too pumpkins are very much in the spotlight right now and this is the day they’re celebrated officially. Bank Holiday Monday – 29th October, if you’re living in Ireland that is! And if you’re like most of us you’ve got these all important dates clearly marked in the diary months in advance so you can make the most of some precious time off. Halloween – 31st October, that spooky feast of ghosts and ghouls, witches and wizards and if you’re not so keen on the spooks it’s also perfectly fine to dress up as your favourite celebrity, Disney character, sportsperson or quite literally anything else that takes your fancy! So that’s our round-up of days you might find handy to fill in those gaps on your social media calendar this month when you’ve either going through a quiet time in business or just looking for something a bit more unusual to talk about. And remember, always ensure it’s appropriate to your business.